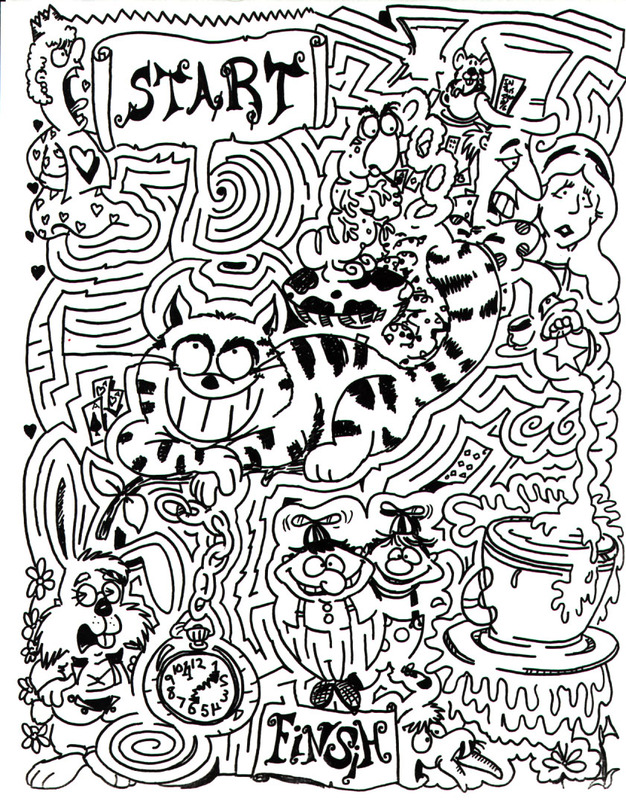 Beside my Lewis Carroll illustrated poem mazes I have also used Alice as a theme for several of my daily cartoons. My latest is a Sunday that will ran November 15th a few days after the 150th anniversary of the publication date of Alice in Wonderland. What draws me and many maze makers to Alice? Well part of the appeal is that the story traces Alice’s adventures within a maze. Another appeal is that Lewis Carroll himself was a maze artist! 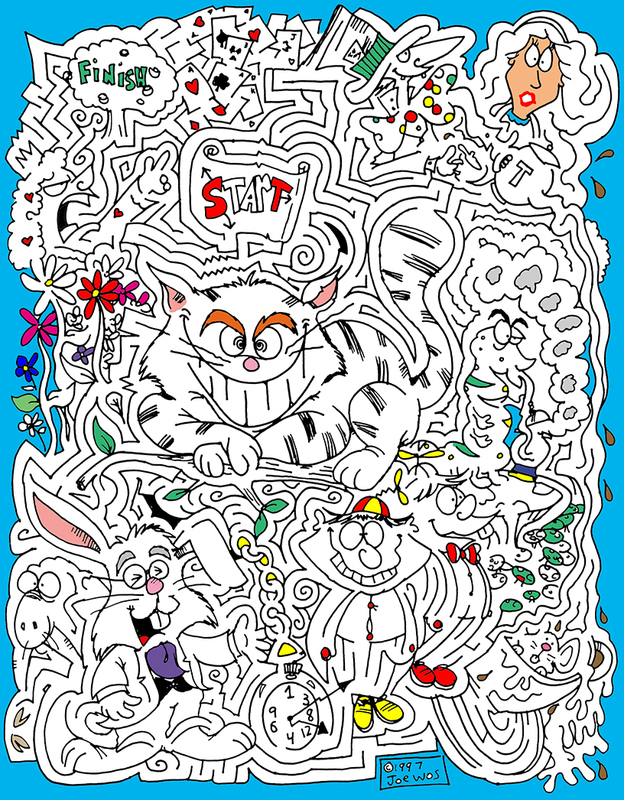 Like Alice in Wonderland mazes have many twist and turns. But most mazes don’t capture the wonderful characters you run into along the way. I think that is one thing that sets my mazes apart. 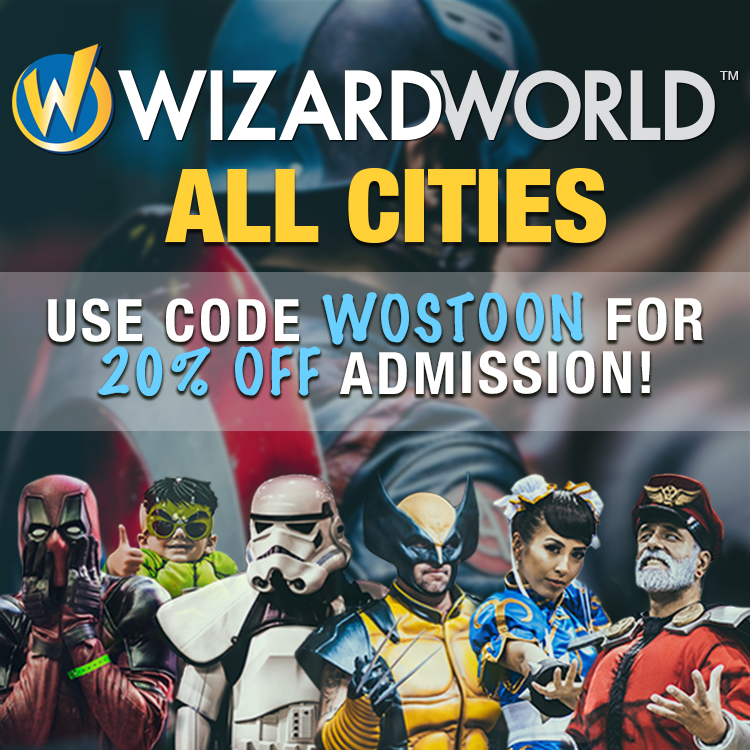 They are illustrated and feature characters that are just as complex as the maze itself. Just when I thought things couldn’t get any worse! One of my teachers from high school sent me a piece of old they hung onto… So going way way back into the archive I am adding this piece! Ugh! Where to begin… This one probably laid the groundwork for all the other Alice mazes and some of it I would keep though the style would change some. 9 years went by before my next Alice maze! My style had evolved a bit. 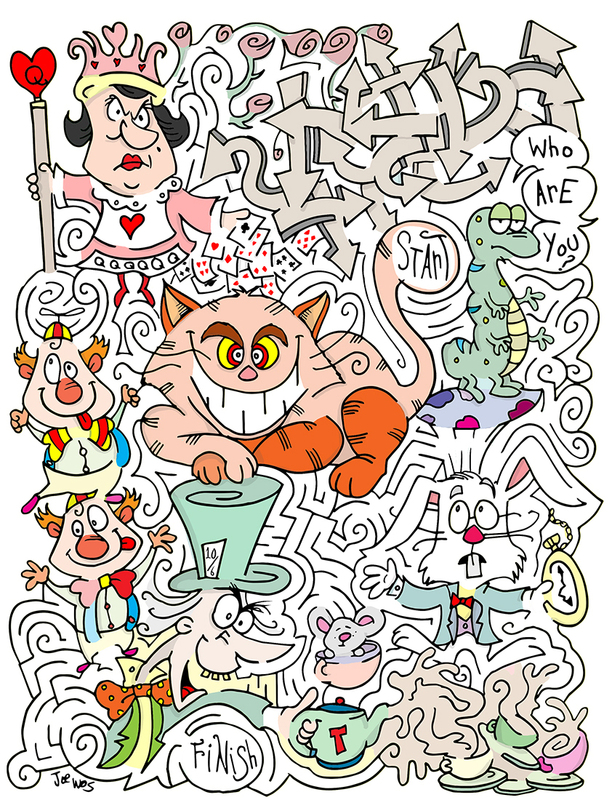 The biggest change was the Cheshire Cat which I like a lot more in this piece. I still didn’t have much of a handle on drawing women so Alice is pretty shoddy. The Mad Hatter is different. The Tweedles and White Rabbit look basically the same but are larger. 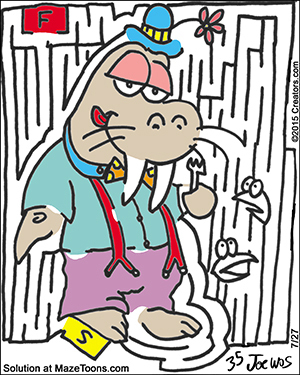 Strangely I still squeezed in the Walrus for no good reason. This is my 2nd Alice Maze. Created 10 years after the previous one it probably deviates the most stylistically though a few characters remain the same- The Mad Hatter features more prominently and Alice is just oddly drawn (I don’t like it.) The Cheshire cat is much more stylized though the pose is similar. I do like the stylized versions of the Tweedles, very cute. I am not sure what I was going for with the Queen? I think I was trying to make this maze a bit darker than my others. I can tell by the expression on the White Rabbit. But I think it failed. 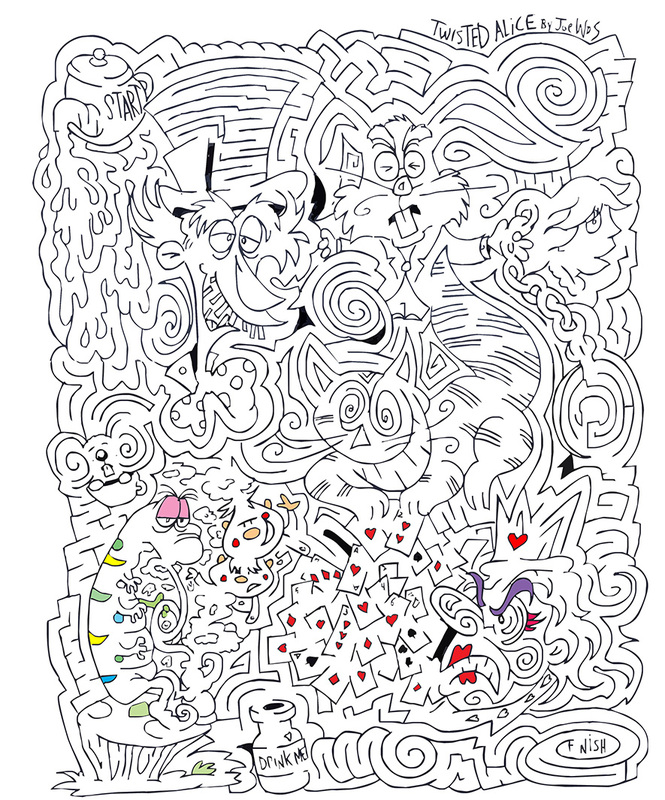 I ran this through illustrator at the time to clean up the lines but I was still struggling with Photoshop and figuring out a way to make the mazes full color without compromising the path wall lines. I must not have liked the end result of this at all, as I gave up on coloring it and it was buried deep in my files! Alice Maze #3 is from 2014 I tried to capture the essence of the first one. 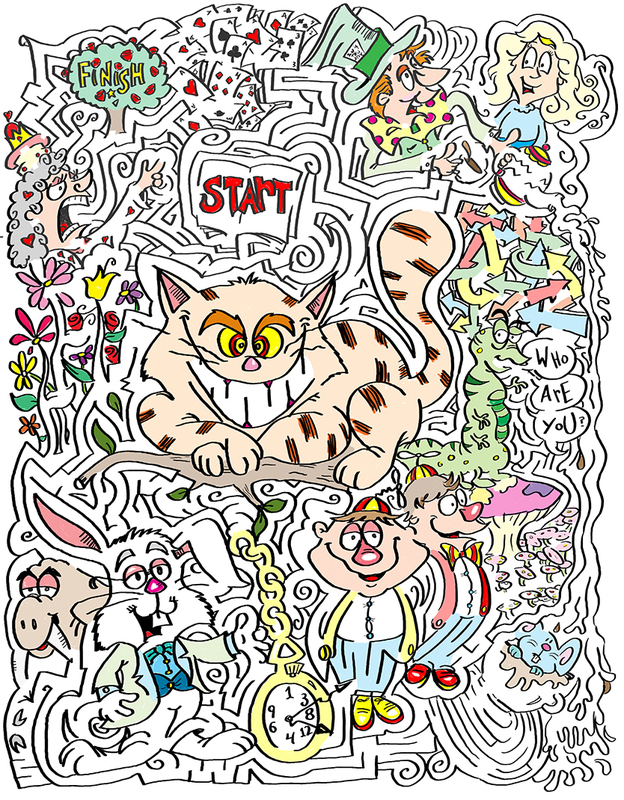 I loved the way I drew the Cheshire Cat and certain other elements in my first maze but didn’t care much for other elements. I wanted to add new colors and update the characters to my then current style. There are some deviations from the original path. I don’t like tracing over mazes but I felt like I had already done this once and just wanted to make some minor changes so I traced in Photoshop, the line gives that away I think. Most of the changes are variations on the preexisting characters. You can also start to see my evolution in coloring in Photoshop! This is my most recent and current favorite Alice maze. As you can tell I started from scratch with a new design and path. I did maintain my central character of the Cheshire Cat. I rarely like one of my own drawings, but there was something about this cat that I just kept year after year. 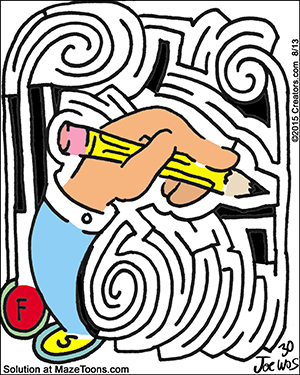 The maze also reflects my more simple path and better coloring work. The characters are much cleaner and fit my current style. You will notice one glaring omission- Alice is not featured in the maze. This was a very direct choice. 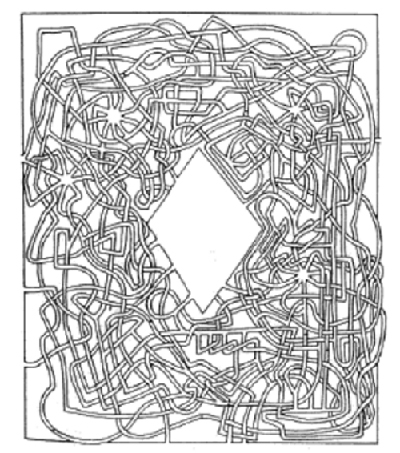 As I began drawing the maze I realized that we are Alice. As you follow the path you encounter the same characters while looking for your way out. 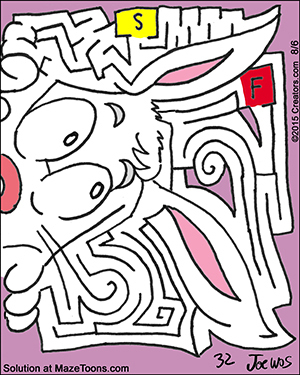 This is probably one of my most popular mazes. Here are a few of the recent dailies. Much easier, these run during the weekdays in newspapers. (distributed nationwide by Creators Syndicate. Ask your paper to carry MazeToons.) I am certain there will be many more. 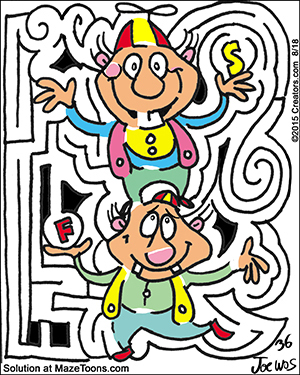 Previous George Takei is a truly A-Maze-ing guy!